The latest ultrafast broadband, known as Gfast, is now available to thousands of people in parts of Birmingham and the Black Country. These are among the first UK locations to pilot Gfast technology, offering download speeds up to 330Mbps – about seven times the UK average. People using Gfast can download a two hour HD film in just 90 seconds, a 45 minute HD TV show in 16 seconds and a nine hour audio book in three seconds. Openreach, the business responsible for Britain’s largest phone and broadband network, has so far made the technology available to more than 390,000 homes and businesses ahead of a nationwide rollout, which will see ultrafast broadband reaching 12 million UK premises by 2020. Locations in Birmingham and the Black Country set to benefit include parts of Aston, Great Barr, Handsworth, Lozells, Ladywood and Perry Barr, as well as areas of Cradley Heath, Dudley, Halesowen, Oldbury and Rowley Regis. Richard Hall, Openreach’s regional infrastructure delivery director, said: “It’s great news that parts of Birmingham and the Black Country are playing a leading role in the development of this exciting new technology. Gfast will help transform the broadband picture in the UK by ushering in a new era where ultrafast speeds are widely available. Gfast technology allows ultrafast speeds, which previously required fibre optic cables to be run all the way to a property (Fibre to the Premises - FTTP), to be transmitted over existing copper lines and fibre broadband cabinets. 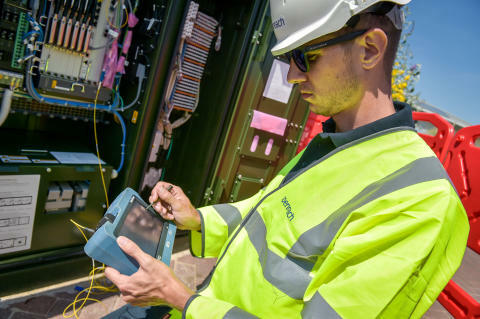 It’s enabling Openreach to make ultrafast speeds available more quickly to a much larger number of homes and businesses than if it focused on FTTP alone. Gfast technology is expected to exceed a million premises by the end of the fiscal year. So far, Openreach has made ultrafast broadband available to hundreds of thousands of homes and businesses across the country – using Gfast and Fibre-to-the-Premises (FTTP) services, which are both capable of delivering ultrafast speeds. More than 770,000 customers already have access to these ultrafast technologies. The rollout of Gfast in areas of Birmingham and the Black Country builds on the existing deployment of fibre technology across the West Midlands, where more than 96 per cent households and businesses already have access to superfast broadband*. Richard added: “Pilot schemes, such as the ones in Birmingham and the Black Country, are important for us to fully test the new network in a number of different situations before it reaches millions of homes and businesses across the UK. The areas we’ve chosen are carefully selected based on a variety of factors, including engineering considerations and the need to test the technology for a range of communities. Birmingham: Aston, Charlemont with Grove Vale, Handsworth Wood, Ladywood, Lozells and East Handsworth, Newton, Oscott, Perry Barr and Pheasey Park Farm. Dudley: Gornal, St James’s, St Thomas’s. Oldbury / Rowley Regis: Langley, Rowley and Tividale. Enquiries about this story can also be made to the Openreach PR team at press@openreach.co.uk. Armley, West Yorkshire; Bath; Bishops Stortford, Hertfordshire; Bolton, Greater Manchester; Brighton Hove, East Sussex; Cherry Hinton, Cambridgeshire; Cheltenham, Gloucestershire; Chorlton, Manchester; Derby, Derbyshire; Donaldson, Edinburgh; Eltham, London; Gillingham, Kent; Glasgow Bridgeton; Glasgow Douglas; Glasgow Langside; Hammersmith, West London; Hemel Hempstead, Hertfordshire; High Wycombe, Buckinghamshire; Hunslet, West Yorkshire; Huntingdon, Cambridgeshire; Kidbroke, London; Liverpool Central; Lofthouse Gate, West Yorkshire; Luton, Bedfordshire; Manchester East; Mansfield, Nottinghamshire; Newbury, Berkshire; Newmarket, Suffolk; Parsons Green, London; Portsmouth North End; Pudsey, West Yorkshire; Rochdale, Manchester; Rusholme, Manchester; St. Austell, Cornwall; Clapham, Balham and Upton Park, London; Swansea, Wales; Swindon, Wiltshire; Sheffield; Wansdworth, London and Whitchurch, South Glamorgan.